The payment of custom duty has always caused arguments between agents and clients who want to bring in cars into Nigeria through ports or land borders. Folks at Jelad ventures have taken pains to explain the procedure to clients and also decided to post on Nairaland,so that clients will not be confused when bringing vehicles into Nigeria. When you're bringing a vehicle into Nigeria,there's is a certain tariff you've to pay and it's always divided into two,bank payments and running costs. The bank payment is what you pay into the bank and it goes directly to the NCS HQ and FG while running costs is what the command you're paying through uses to print your documents etc. Using the two pictures below as illustrations,we can see the tariff booklet is divided into three sections,year,value and bank. A) Year - the manufacture year of the vehicle been bought into Nigeria. B) Value - the estimated dollar value of the vehicle been brought into the country. C) Bank - this is what the FG actually actually expects the agent pay into the bank as bank charges for his/her client's vehicle. Please take note that apart from year of manufacture,vehicles are also rated according to engine capacity,which means your vehicle may be 20% or 35% engine capacity. Also please note that the NCS having discovered that the bank charges were too expensive reached an unwritten agreement with agents,which means an agent can shave three/four years off the actual year of the vehicle been brought in,to make it affordable for the clients. Now let's use three vehicles as examples using the pictures shown below. 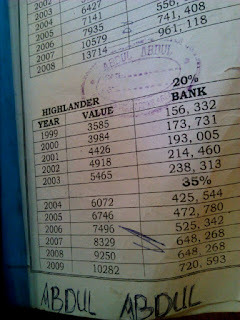 A) 2002 Highlander - as we can see from the pictures, 2002 Highlander is rated as 20% engine capacity,valued at 4,918$ and with bank payment of 214,600,which means any importer bringing in an 02 highlander has to pay at least 350,000 =N= to obtain duty papers. 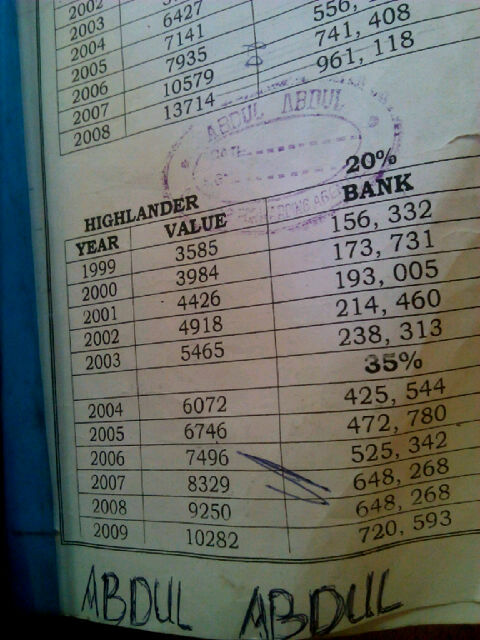 350,000 =N= must have been high for importers to pay,so an agent can use his/her discretion to run the duty papers has 1999 highlander (2002-3yrs=1999),which means 156,000 naira is paid into bank and the importer pays 250,000 has custom duty charges. B) 2008 Highlander - from the pictures below,we can see that 2008 highlander is rated as 35% engine capacity with a dollar value of 9,250$ and bank payment of 648,268 =N=. 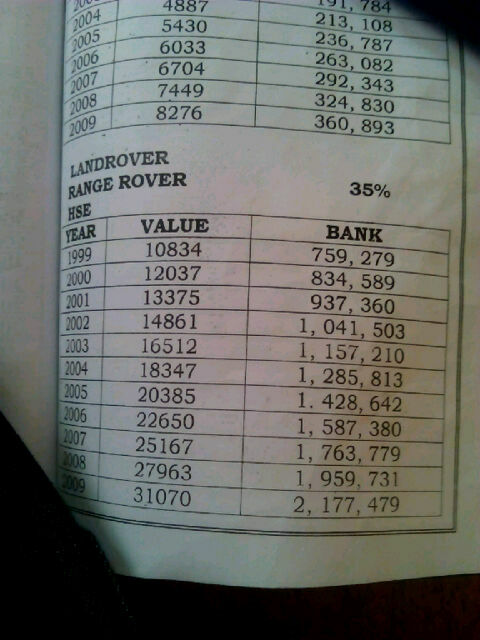 All the agent needs to do is declare the SUV has 2004(2008-4yrs=2004),which means 420-450,000=N= can be paid into the bank while the importer pays 550-600,000=N= as bank charges. C) 2006 Range rover HSE - From what we can see,the RRS is rated as 35% engine capacity with dollar value of 22,650$ and bank payment of 1,587,380M =N=. This particular vehicle has always been a source of confusion between importers,agents and custom officials. In some instances,we've agents who declare it has 2002(2006-4yrs=2002) and they pay =N=1M has bank charges while the importer pays 1.2M for duty charges. We also have agents who take risks in declaring the 06 RRS as 1999 or below,which means they pay 600,000 =N= as bank payments while the importer pays 850,000 =N= as running cost but absolute care should be taken because in a situation where one agent manages to bribe his/her way out,it may not work for another agent and in such case,the vehicle may be impounded. Now,note that when vehicles are impounded and it's about been recovered from custom officials,a DL is raised. DL means direct levy and in this case,the importer is asked to pay the original bank charges he/she was supposed to pay and also pay a 20% fine with running costs. Running costs using seme border as an example is what an agent pays to type the documents,collect value for the vehicle,assessment and examination of vehicles and tagging. Tagging of documents is very necessary especially across land borders because these photocopies are essential,they're are records the Fed. Ops. Unit and CG squads submit in ikeja and Abuja commands to show that your vehicle passed through their checkpoints. When next you're bringing in your vehicles in through land borders or ports,always make sure you take care that your agent doesn't short pay. Short payment means making false declaration e:g declaring an 06 RRS as 02 RRS or declaring 2007 camry as 98 camry or 2002 sienna has 1996 toyota bus. All these acts put the vehicles at risk and it's always common amongst dubious agents and car dealers who want to make more gain from car sales,that's why we now see more and more cheap cars coming out of lagos ports and at the end,these same cars are impounded by custom officials. Now the following post was written as by the management of Jelad ventures and it doesn't not serve as the opinion of every custom agent operating at the ports or land borders. If at anytime,there are other agents who want to add to this post,they're free to do so.